I am flying off to Ireland today and have much to do to get ready for the flight, but I wanted to take a moment to thank you all for your continuing prayers and support. The past three weeks have been a huge challenge and struggle for me. First, trying to find out the source of my severe back pain; then learning about the compression fracture; then learning about the additional cancer activity in lymph nodes pressing on the L4 vertebrae which will require radiation and potentially new/different chemo (for that and the small nodules I’ve had in the lungs); plus trying to manage the back pain with ice, heat and medications (one of which I found I was allergic to in the process); and having recurring sciatica pain as recently as Monday and Tuesday leaving me to question if I’d physically be able to make the trip. Despite all that, I made a decision while laying down letting the ice pack numb my pain Monday morning to press through the pain. To keep going and doing. To keep planning my trip and recording my CD. By the end of yesterday’s recording session I was feeling better and we were wrapping up when I got a call from a friend. Her name is Anne Downes and she and her husband, Michael are originally from Ireland. She was calling to say she heard I was going to Ireland this week and to say that she and Michael were also going to Ireland this week. In fact we all leave today about the same time but on different airlines! I then come to find out they are going to be in Derry, too, this weekend for a wedding. That is the town I’m going to for the Fleadh, the All-Ireland Music Competitions, for which I’m competing in the Newly Composed Songs in English category. She then tells me they are planning to visit the Giant’s Causeway. I said I wanted to visit the Giant’s Causeway (known as the 8th wonder of the world!). She then invites me to join her and Michael when they make that excursion on Sunday. She then asks me what I’m doing after Derry and I say I need to get to Galway on Monday to meet up with some friends with whom I’m staying. She then immediately offers to take me to Galway! I said, are you serious? And she says yes, that after Derry and the wedding, she and Michael are free agents to go where they please and they had planned to go to Galway, too. She also says they wanted to visit the town of Knock, where Our Lady of Knock shrine is located (which was also on my want to do list for this trip!). It was like an amazing gift from the heavens (which of course, it IS!) and a more divinely inspired plan from God for my trip than I ever could have planned for myself!! I’m overcome with joy and gratitude for Anne and Michael! They have literally MADE my trip complete! Interestingly, five years ago in 2008 when I was competing at my first Fleadh in Tullemore, Anne and Anne’s brother Des drove up from a town two hours away to see me compete, support me and cheer me on and then celebrate my accomplishment afterwards of just being there to sing my song and share it with the world of the Irish. That was just two months after I was originally diagnosed with cancer. It seems so very appropriate that God found a way for us to connect in Derry for this Fleadh as well! God truly works through mysterious ways to provide a plan and an outcome that is even better than anything we could imagine ourselves! I woke very early this morning at 4:30 a.m. I had gotten up to eat some cereal and take my pain med when suddenly the words to a new poem just came to me. God inspired! As you are my family and my friends, I wanted to share this with each of you. I am very blessed you are in my life!! I feel very blessed to be alive!! I will awake this very morning, on the threshold of my dream. To me, Mass (capitalized) is more than a celebration of the Eucharist. It’s a coming together of a community of people who worship, pray, share and celebrate their faith in God together. Not unlike the community of prayer warriors – my friends and family – I called upon a couple weeks ago when I had a major health scare. I drove up to St. Louis on May 16th to begin my 2013 Spring Tour. I had several book signing and concert events scheduled across the week, as well as family visits and celebrations. In addition, I was competing at the Midwest Fleadh, an Irish music competition, the weekend of May 17 & 18th. That Saturday, May 18th, I spent the day at the Fleadh and won a gold medal for Newly Composed Irish Songs in English. I wasn’t feeling well that day and throughout the day had experienced growing and more intense pain in my lower back on the left side where the kidney is located. Normally, I would have stayed at the hotel where the Fleadh was occurring and played music or sang songs with friends until the wee hours of the morning. Not this time. I just didn’t feel well and the pain wasn’t going away. Uncharacteristically, I left the Fleadh early that evening and headed back to where I was staying for the weekend. Concerned, I called my doctor in Little Rock and described my symptoms. He suspected a possible kidney stone and advised that I should go to the ER to have it checked out, especially, he said, if by morning the pain had not subsided. At midnight, the pain was no better and the thought of a sleepless night in pain was not appealing. I called a family member and asked to be taken to the ER right away. As a three-time cancer survivor, hearing the word “mass” (non-capitalized) is not what I would describe as “music to my ears.” In actuality, it is a terrifying word to a cancer survivor and his/her family for it represents a major “game changer” in the grand scheme of life. Hearing about a new suspected “mass” is NOT good news and instantly of grave concern. Personally, I think the word “mass” should be stricken from physicians’ vocabularies. It serves no purpose other than scaring patients half to death. I looked at the attending ER physician with a calm, yet concerned and bewildered puzzlement. I said, “But I had a CT scan a month ago and there was no indication of this (mass).” Further, I added, “And I’ve been on chemotherapy for six months. It doesn’t make sense that a new tumor could grow in a month’s time while on chemotherapy. Further, I’m on Avastin (a chemotherapy IV drug). My last treatment was just a week ago. My doctor says I’d have to wait a month before having any kind of surgery. Have you spoken with my doctor in Little Rock? Have you actually spoken with him on the phone?” I asked. He went to call my doctor in Little Rock. I’m thinking… I’ve got a book signing, two concerts, a festival and party for my sister’s 60th birthday this week. I do not have time to spend in the hospital for a month! I have things to do!! After further discussion, it was decided I’d be discharged from the ER in St. Louis with oral pain medication until I could get the CT scan images to Little Rock for my Little Rock physician to see and compare to the prior month’s scan. The ER physicians in St. Louis were at a disadvantage as they did not have access to the CT Scan from Little Rock from the prior month. My doctor in Little Rock was at a disadvantage as he did not have immediate access to the scan the St. Louis ER physicians had taken that morning to know or understand what new “mass” they were seeing. The next step was to get the St. Louis scan images to Little Rock so my Little Rock doc could compare them side-by-side with the scan from the prior month to determine what was really going on. The resident ER doc came back to see me to cover my discharge instructions which included seeing my doctor in Little Rock “tomorrow” (Monday). Nonetheless, she said, that is what he requested. I told her I’d call him later that day (Sunday). After speaking with my doc in Little Rock on Sunday afternoon, I decided to Fed Ex the CT scan images to him. The earliest I could get the scans to him was Tuesday morning. I also decided to look into flights to Little Rock for that same morning. That would leave me Wednesday or Thursday to get back to St. Louis for my gigs. I proceeded with my book signing as scheduled on Monday and enlisted my niece, Mary, to help me with it. That way if I had problems with pain management, my niece would be there to help cover for me. The Monday book signing went off without a hitch. I was able to manage the pain with Tylenol. I performed some songs and visited with friends who came to the book signing. All went well. Clearly, I was not in control of this situation and needed prayerful help to see me through whatever I was going to have to face. On the flight to Little Rock Tuesday morning, I literally pictured myself “handing the reins over to God.” I knew in this instance, I needed to place my trust in God for whatever outcome was presented. If I had to cancel all my gigs the rest of the week, I’d have to cancel all my gigs. Those who know me well know that cancelling a gig is the very last thing I would ever do as a musician. I would only cancel a gig if faced with a dire emergency and had absolutely no other choice. Yet that was a distict possibility I faced with this situation. I met with my Little Rock physician early Tuesday afternoon. He got the scan images from St. Louis and met with the radiologist to compare them side-by-side. I asked if I would be able to travel after the procedure and he said yes. The outpatient procedure to insert the stent was scheduled for Wednesday morning. I rested Wednesday afternoon and my husband drove me back to St. Louis on Thursday. I performed my two concerts on Friday as scheduled. I attended and sang at my sister’s 60th birthday party Saturday night as scheduled. I performed at the festival on Sunday as scheduled. I drove myself back to Little Rock on Monday as scheduled. I am deeply grateful to my prayer warriors – my family and friends who answered my plea for help. I know I and my family could not have gone through those three anxious days without your prayers and good wishes lifting us up! I am deeply grateful to an AWESOME God – I thank Him for taking the reins and guiding me to Little Rock to get the diagnosis and care I needed so I could return to St. Louis to fulfill my commitments. In the moment that I instinctively knew I needed to place my trust in God, I did. I feel very blessed things turned out the best way possible. No new cancerous tumor, an easy fix to the problem, and I was able to meet all my performance commitments. You can’t get any better outcome than that! Thank you, Jesus!! And thank you, my friends and family!! To my family and friends who attended my performances – the concerts and the festival – thank you for your love, support and prayers! You definitely saw me through several very difficult days and I could not have done it without you!! “No mas” is a Spanish term I learned from our friend and favorite waiter at Senior Tequilla’s restaurant, Jose. George and I tell Jose “no mas” when we’re finished with our meal and don’t want any more margaritas. He smiles knowing how much we liked our dinner and would love to have more, we just can’t fit any more food into our bellies. I believe this recent health scare is a “no mas,” “no more” situation for me. I believe I am very close to finishing my current round of chemotherapy and, with the grace of God and continued prayers from my family and friends, my three-time cancer journey is at long last finished and complete. It’s time for more music and songs and singing! I often ponder this question with respect to my own life just about every day if not several times a day! Sure, there are some things I am planning for – like recording my next CD and doing research and interviews for my next book – and for those, I know what I’m planning to happen next, but other things are completely out of my control and may occur out of the blue as complete surprises. One of the “what next” surprises in my life occurred almost five years ago when I was diagnosed with rectal cancer. I was having some symptoms and suspected something was wrong so in a way the diagnosis wasn’t a complete surprise, but anytime you hear from your doctor that “Yes, it is malignant. Yes, it is bad. And, yes it is in a bad place,” the news stops you in your tracks and gets your undivided attention. I recently discovered a relatively new resource online called WhatNext.com. This website is free to anyone diagnosed with or caring for someone with cancer and matches the person up with other cancer survivors with a similar diagnosis. You can post information about your own experience and what you went through (types of treatments, side effects, celebrations, “oh no’s,” etc. ), questions to ask others, and answers to questions you may have to offer others. It is an exchange of experiences and helpful information from those in the trenches like yourself who are living with or recovering from the same type of cancer you have. I wish I would have found this three years ago when it was first created, but I’m grateful nonetheless that I’ve found it now. I have already posted some of the major milestones for my cancer journey, responded to some questions/problems others have posted and asked a few questions of my own about what I’m currently experiencing. I was initially overwhelmed by the positive and uplifting messages others posted to my page to welcome me to this online community of cancer survivors the same day I registered. It was a huge heart-warming welcome hug of love, connection and support. For anyone reading my blog who has a family member of friend in the midst of the cancer fight, please share this website with them: http://www.WhatNext.com. There is also a wealth of information and resources from the American Cancer Society website, which is http://www.cancer.org. I also recommend visiting the National Cancer Institute (NCI) website within the National Institute of Health website provided by our federal government – http://www.nih.gov. I found the NCI website provided helpful list of questions to ask your doctor when you’re so shell-shocked by the initial diagnosis that you don’t know what to ask because you don’t know what you’re dealing with and just don’t know what you don’t know. The NCI website has a wealth of information to get you started. None of us truly know what’s next, but there is help available to us for whatever surprises come along our life’s path. We just need to ask and/or look for the help. It’s there! I hope you find these resources helpful. Take care & God bless! In February, I attended the funeral or “home-going” for Georgia May Spencer-Bush. Georgia was someone I knew who worked at both Baptist Health and St. Vincent when I was employed by those companies. She worked as a cashier in the cafeteria. She knew everyone and everyone knew her. She had a great inner spirit about her. Her face just emulated light. She had a beautiful smile and would always ask us how we were doing as we came through her cashier line. She knew me well enough to know when I was troubled or worried or concerned or not feeling well. And, if so, she always had something encouraging or empathetic to say that made me feel better for having seen her and spoken with her. It always brightened my day to see Georgia. We learned early on to get into Georgia’s line if the cafeteria was crowded. She’d move faster than any other cashier to ring up our food and get us back to work as quickly as possible. She understood and appreciated that, in a hospital setting, it was important for the nurses and patient care staff to get through the line as quickly as possible as many of them had only 15-30 minutes to break for lunch. I remember a time at Baptist when there was a big campaign on about the proper wearing of name badges. It was a Joint Commission requirement and hospital administration was cracking down on everyone to be sure our badges were displayed properly. I had noticed that Georgia’s badge was always turned the wrong way so no one could see her photo or name. In her case the badge wasn’t just accidentally flipped over. I noticed that she had actually clipped it on backwards every day. I thought about saying something since I was involved with the customer service and satisfaction improvement teams at the hospital and so one day I asked her about it. I said, “I notice your badge is flipped.” “Oh, yes, sorry about that.” She flipped it over correctly. I told her I had noticed it was flipped most of the time and wondered why. She said she didn’t like her name. I asked her, “What is your name?” She said, “Georgia.” I said, “I think Georgia is a pretty name.” She said, “Well I don’t like it.” She added that she had asked the human resource department to put on a different name, but they had refused – I suspect this was probably due to some policy requiring the use of real birth names versus nick names. Georgia seemed frustrated by their refusal to honor her request. So then I asked her, “What do you prefer to be called?” And she said, “Miss G.” So I started calling her Miss G from that day on. I learned she was a fierce prayer warrior and helpful friend to many. And even though her death was sudden and unexpected and came way too soon for those who knew her, her home-going was a beautiful tribute to how this one woman impacted so many lives in such a powerful and positive way. The pastor made the immediate analogy to how God uses our life experiences and pain here on earth during our lifetime to carve us into the perfect beings we need to be to enter into heaven when the time comes. I thought of Miss G and how, from my perspective, she already was a perfect being and ready to be with the Lord, even if we weren’t quite ready to let her go. As I heard the pastor tell this story, I was immediately and personally struck by it both emotionally and spiritually. 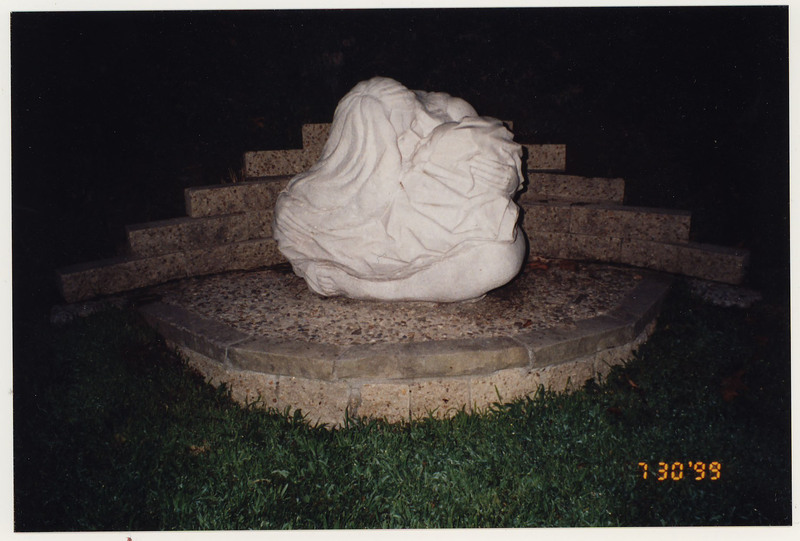 I recognized that I, too, as we all are, was going through a stone-carving process to allow me to be with God when I die. The words, “carving in stone” echoed in my mind as I thought of the song I wrote several years ago called “Carving in Stone.” I thought, WOW, Georgia’s talking to me from the grave! She’s saying to me, “Keep doing what you are doing for God is not finished carving you yet. There’s more for you to do here. There’s more for you to do to serve others with your music.” WOW, I thought. Thank you, Georgia! Thank you for helping me to see that. I had instinctively sensed that I needed to attend Georgia’s home going and now I know why I was called to be there. Here are the words to my song, “Carving in Stone.” To listen to a sample of the song, visit my website at http://www.CellaDawnMusic.com. * Tip Off to St. Patrick’s Day Weekend with Irish Songs & Stories at Hibernia Irish Tavern, 9700 N. Rodney Parham Rd. in west Little Rock. 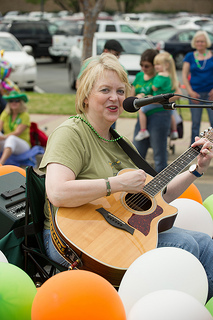 Peg will perform traditional and original Irish and Irish-American songs from 7-9:00 p.m.
* Watch KARK, Channel 4’s Noon show to see Peg promote the 14th Annual 2013 Rock to North Little Rock St. Patrick’s Day Parade. She will sing one of her original songs, “The Fiddler’s Feet” which describes what it is like to experience a traditional Irish music session. * Peg will make a brief appearance at Catholic High School as part of the School’s custom to honor the Irish the Friday before St. Patrick’s Day. According to Brother Richard Sheien, a teacher at the school, “Each March we honor the Irish on the Friday before St. Patrick’s Day an play Irish music as the boys move between classes.” Loyd will perform a short program of Irish songs for the students and faculty of the school at 1:15 p.m.
* Peg will be one of several representatives of the Irish Cultural Society of Arkansas who will provide a display of Irish culture and program of Irish music and songs at Little Rock City Hall from 2-3:30 p.m. during a reception the City is holding for its employees. * Peg is the featured singer/songwriter in the 14th Annual 2013 Rock to North Little Rock St. Patrick’s Day Parade performing from the Shamrock Lawncare float. The Parade will occur at 1 p.m. Saturday, March 16, 2013 and begins at Third and Rock in downtown Little Rock, travels over Third Street and Sherman to River Market, crossing the Arkansas River via the Main Street Bridge into the Argenta Arts District ending at Fifth and Main in North Little Rock. The Parade is presented each year by the Irish Cultural Society of Arkansas. The presenting sponsor of the Parade this year is the North Little Rock Visitors Bureau. This event is free and open to the public. For more information about the Parade, visit www.IrishArkansas.org. * Peg will be joined by Bill Beard, lead fiddler with the Arkansas Country Dance Society dance band, and will perform traditional Irish music during and following the annual St. Patrick’s Day Mass held at 9:00 a.m. at St. Edward Catholic Church, 801 Sherman in downtown Little Rock. Aspects of Irish culture including Irish language, music, songs and dance are incorporated into the Mass. Following the Mass a reception of Irish music and dancing will be held in the Church cafeteria. Irish soda bread, scones and tea will be served and a short program of Irish dance will be presented by the McCafferty School of Irish Dance and the O’Donovan School of Irish Dance. This event is free and open to the public. 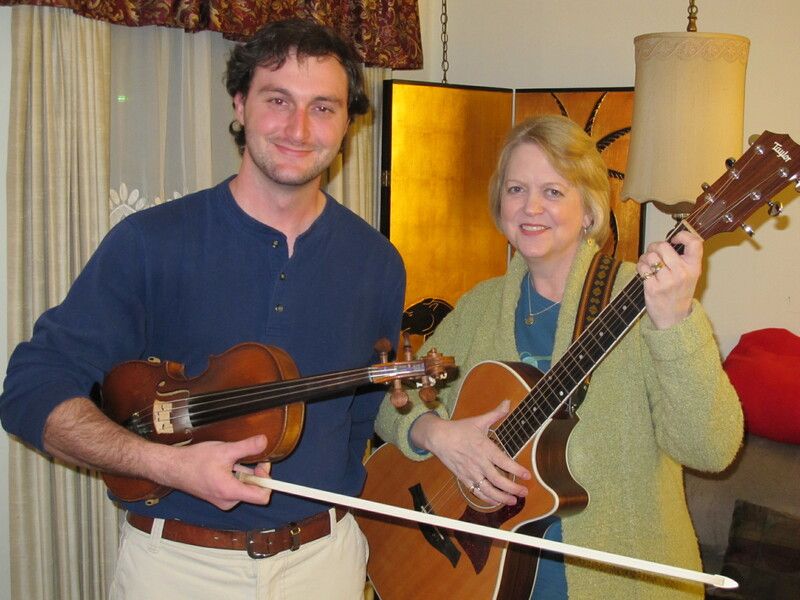 * Dugan’s Irish Pub is hosting a St. Patrick’s Day Celebration and that includes Peg Roach Loyd & Cory Winters performing traditional Irish music and songs from the inside stage from 4-6:00 p.m. This event is free and open to the public. * Wrapping up St. Patrick’s Day weekend, Peg Roach Loyd & Cory Winters will appear at Ernie Biggs Dueling Piano Bar, 307 President Clinton Ave., from 7-8:30 p.m.
For more information, visit www.CellaDawnMusic.com. P.S. Peg’s newly designed website is coming soon so please check back in a few days for a completely new look! Been Too Busy to Write My Blog! For starters I’ve been booking, planning and rehearsing for St. Patrick’s Day related music gigs and have a full schedule of appearances across the next two weeks. My “March Music Madness” started this past weekend where I performed with my friend and musician/guitarist John Burleson at the North Texas Irish Festival in Dallas. We had a great time at the festival with song sessions, music sessions and time with friends old and new. This week, my schedule begins with hosting the Irish Song Session at Dugan’s Irish Pub on Thursday, March 7 from 7-9 p.m. and performing at the Historic Arkansas Museum for their new exhibit as part of 2nd Friday Art Night on Friday, March 8 from 5-8 p.m.
You may see my compete schedule of upcoming performances on my website, www.CellaDawnMusic.com. Speaking of the website, I’ve been busy writing fresh content for my NEWLY designed website, (designed by the wonderfully skilled and creative Marcella Wiggins, my webmaster) which is about to debut SOON! By “SOON” we (and I do mean “we” as this is a team effort of Marcella and me) are shooting for the end of this coming weekend, March 10th (God willing and the creek don’t rise!). Next, I’ve also been working hard to promote the 14th Annual 2013 Rock to North Little Rock St. Patrick’s Day Parade that is happening on Saturday, March 16th at 1:00 p.m. The Parade starts at 3rd & Rock in Little Rock, travels through River Market, crosses the Main Street Bridge into the Argenta Historic District, ending at 5th and Main in North Little Rock. Our Parade permit allows us to go to 6th and Main so if you want to watch the parade in that last block, that’s cool with us! We love having spectators line the entire parade route from start to finish. I sure hope you come out and bring your kids, families and friends as the Parade Committee has worked extremely hard this year to make the Parade the best yet! For more information about the Parade, visit the Irish Cultural Society of Arkansas website: www.IrishArkansas.org. Next is the planning of the annual St. Patrick’s Day Mass on Sunday, March 17th at 9 am at St. Edward Catholic Church located at 9th and Sherman in downtown Little Rock. The Mass celebrates the Patron Saint of Ireland and includes various aspects of Irish culture – Irish language, songs, music and dancing. There is a reception in the church cafeteria after Mass with includes a short program of Irish dance from the McCafferty School of Irish Dance and the O’Donovan School of Irish Dance. If you don’t think I have been busy enough to be neglectful of my blog, there have been a few other things I’m working on in addition to the above which I’ll talk about when the time comes. For now, suffice to say that I’m gearing up for a fun and successful celebration of all things Irish across the month of March and I hope you will join me for some or all of it! I’ll tell you more about the book launch AFTER St. Patrick’s Day! Oh, and remember to wear your green! I had a wrestless night and woke up feeling fatigued, like I needed some extra R&R today. Then I walked into the living room and saw the boxes. Five boxes filled with my new book. A really big smile came over my face and I said out loud, though no one was present to hear me, “Awe! They came!” My first shipment of books had arrived last night and my husband found them on the porch this morning and brought them in for me. Sweet man! Now it’s real. Now it begins. Now I truly start living the life I’ve dreamed about.